Justin's practice focuses on civil defense litigation and healthcare. 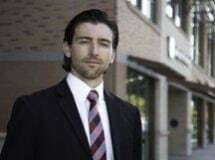 In his litigation practice, Justin defends both individuals and entities in class action litigation, medical malpractice, insurance coverage and bad faith, personal injury defense, employment litigation, and business disputes. In his healthcare practice, Justin advises healthcare clients in HIPAA and other state and federal regulatory compliance issues. Justin is admitted to practice in all Montana Courts and the United States District Court for the District of Montana. Justin was raised in Missoula where he attended Sentinel High School and the University of Montana. He obtained a Juris Doctorate from the University of Montana School of Law, with honors. While in law school, Justin was a two-year member of the Trial Team, where he competed at both the regional and national level. Following law school, Justin clerked for the Honorable Carolyn S. Ostby, United States Magistrate Judge, for a two-year term. He has since been in private practice with Garlington, Lohn & Robinson. Justin, his wife and their son enjoy their spare time hiking, camping, fishing, and skiing in Montana's beautiful outdoors, and spending time with friends and family.